Richard Hosch could see a common theme developing on his table at the Heart of Williamsport “Summit Up” event Wednesday night. The theme was the transition of the city’s downtown as a destination with more attractions, such as the Susquehanna River Walk, and a myriad of restaurants and specialty shops connected by a network of streets and nearby neighborhoods. 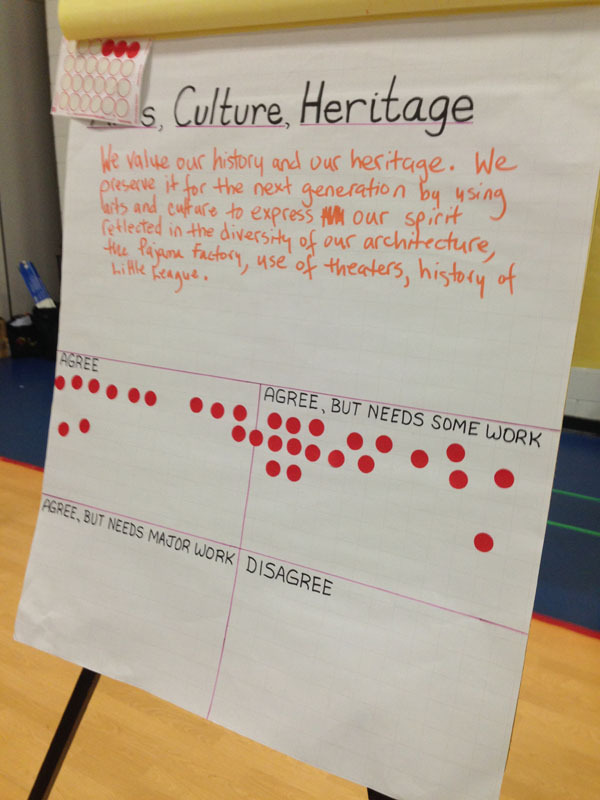 Hosch, a chef with a catering business on West Fourth Street in the Historic District, was one of about 50 individuals who gathered for a few hours inside the Cochran Primary School to go over the results of a communitywide survey. 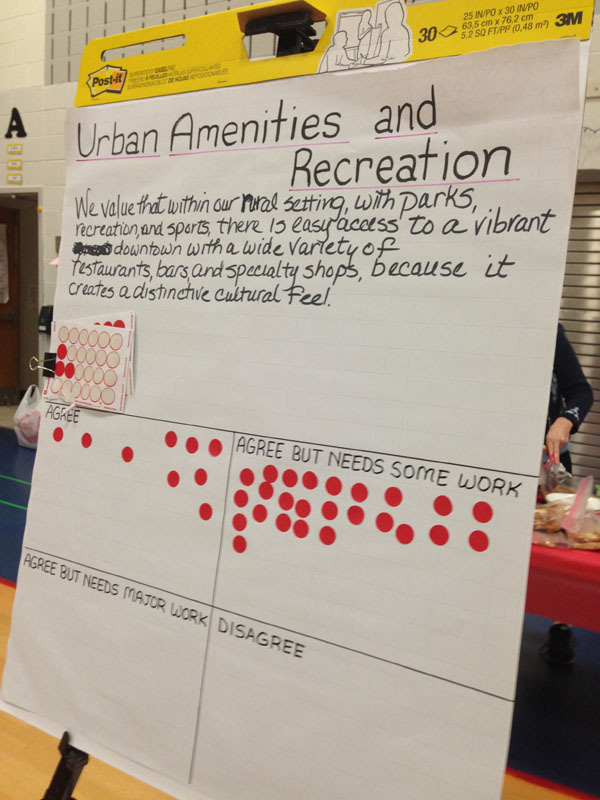 It included the thoughts of 944 respondents who explained what was important to them about the city and what changes they wanted to see. Ruth Keller, a former public relations director, said the summit was “good to get people out.” She said she has a special interest in seeing neighborhood watch groups spread throughout the city to deter crime. 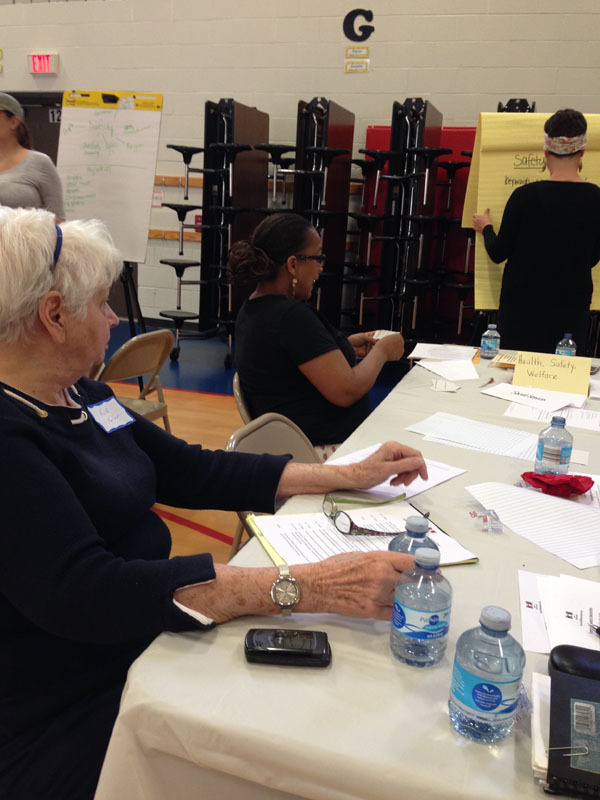 Participants first filled out a demographic chart listing details such as their age, housing status, gender, ethnicity and household income. 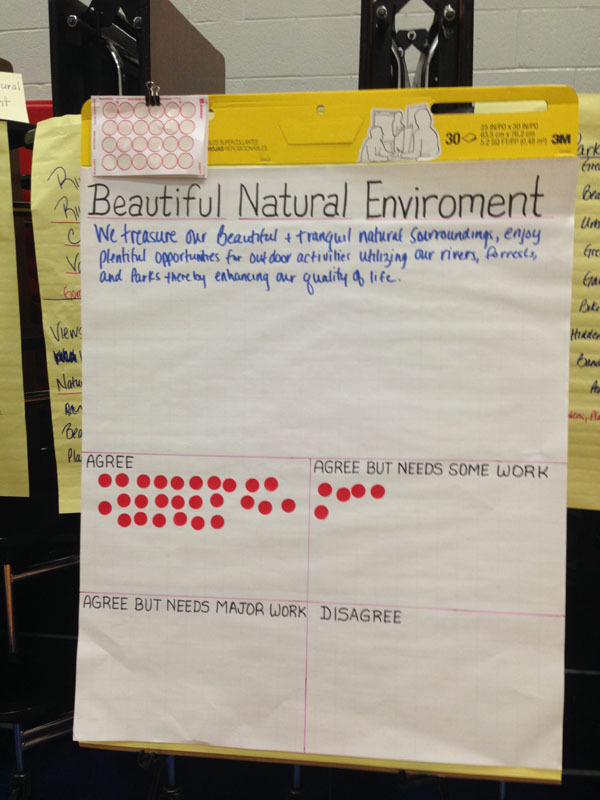 The returned data from the survey was organized by themes for groups on the tables. They included educational assets, activities and events; opportunities and economic growth; urban amenities and recreation; arts, culture and heritage; small town feel and location; beautiful natural environment; health, safety and welfare; and diverse community. 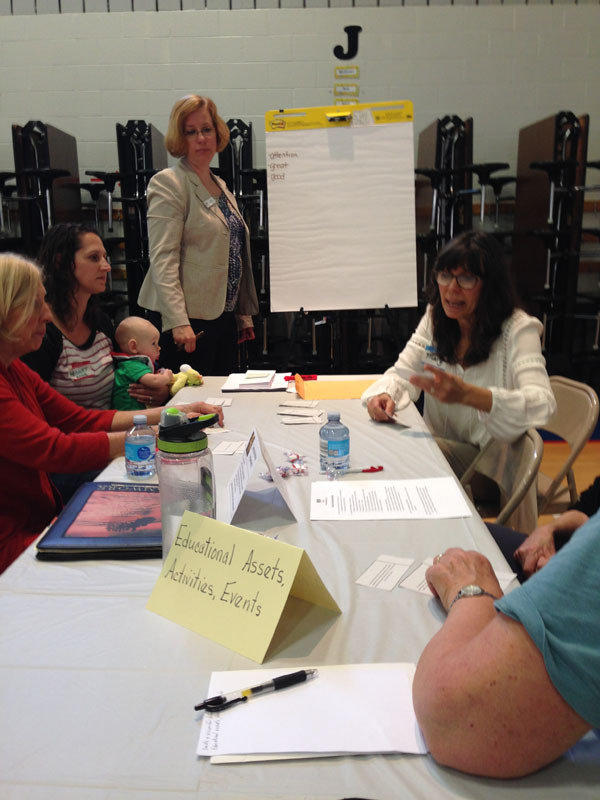 “I enjoy taking part in the ‘Safe, Clean and Green’ in my neighborhood,” said Margaret Tupper, of Arch Street in Newberry, who was on the education assets table. The event she referred to is a bi-annual litter collection promoted by the Newberry Community Partnership. The collection often brings people together, but more volunteers are needed, said Alannah Gabriel, a longtime coordinator of the group, who joined her friend Tupper for the summit. 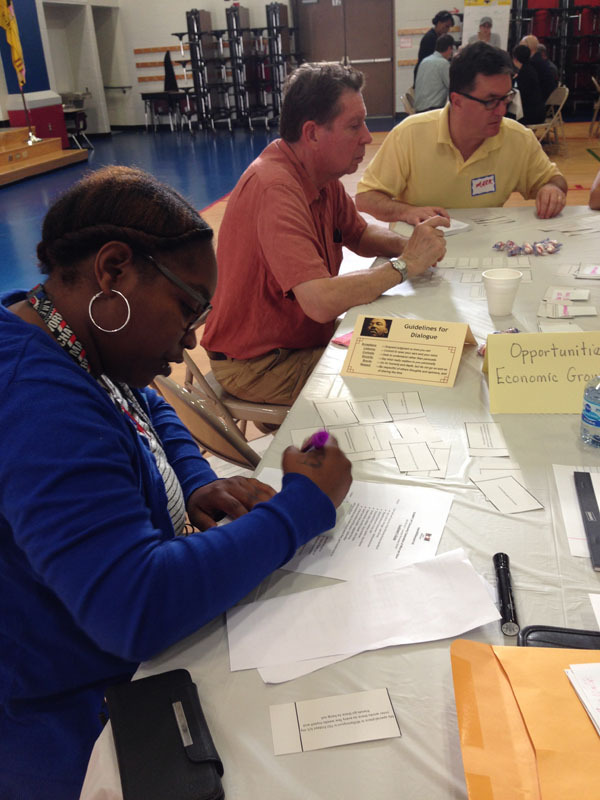 David Defebo, of Woodmont Avenue in the Vallamont section of the city, sat on the opportunities and economic growth table. He read dozens of the responses, breaking them into sub-sections. They included ideas such as the city’s low-cost living compared to places such as New York or San Francisco, and its educational opportunities, with a college on either side of the city. 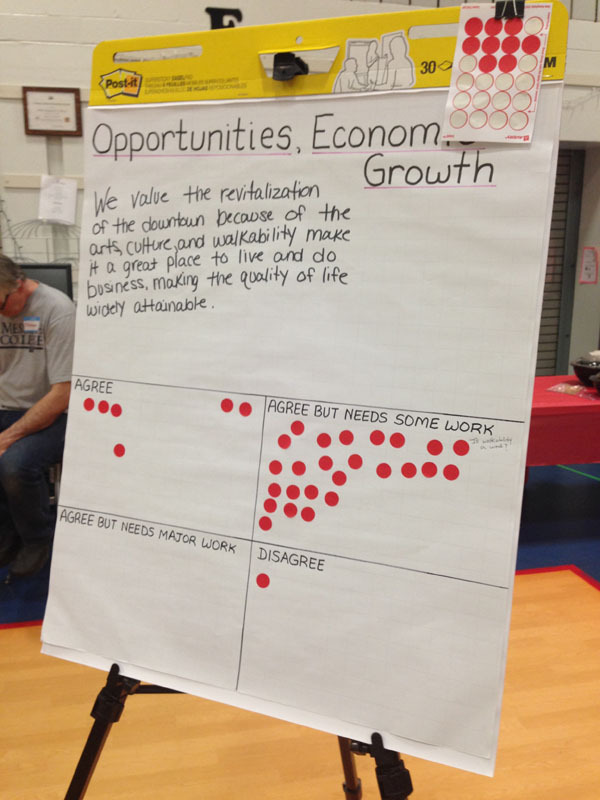 One response focused on the connectivity of the arts, culture and opportunity as a means for quality of life. A predominant theme was the changing look of the downtown since 1999 and how its revitalization continues to bring opportunity for employment, entice new developers and improve neighborhoods. Some 109 of the 944 responses involved Little League — not just for a superior form of supervised recreation and sport but also as a measure of the importance of Little League in the city’s heritage, as the place where Carl E. Stotz grew up and as the site that was the birthplace of the game, said Alice Trowbridge, of Susquehanna Greenway Partnership. The community’s small town “feel” and short driving distance from metropolitan areas were among the favorites for one person. The city’s short distance from state parks, hunting camps, fishing streams, hiking and biking paths, skiing and canoeing and paddling on rivers and creeks was the lure for another. Many families valued the children’s library at the James V. Brown Library and a responsive city government that makes itself accessible by holding public meetings and hearings. Another table received numerous responses on the diversity of the community, which is one of its stronger points because of the younger generation that visits and uses businesses, some of which have been developed by young entrepreneurs. Others valued the city and region’s public transportation system, one that is “cost-efficient and easy to use,” and still others saw value in the shopping district and its outreach toward customers, especially with many big-box stores closing their doors. 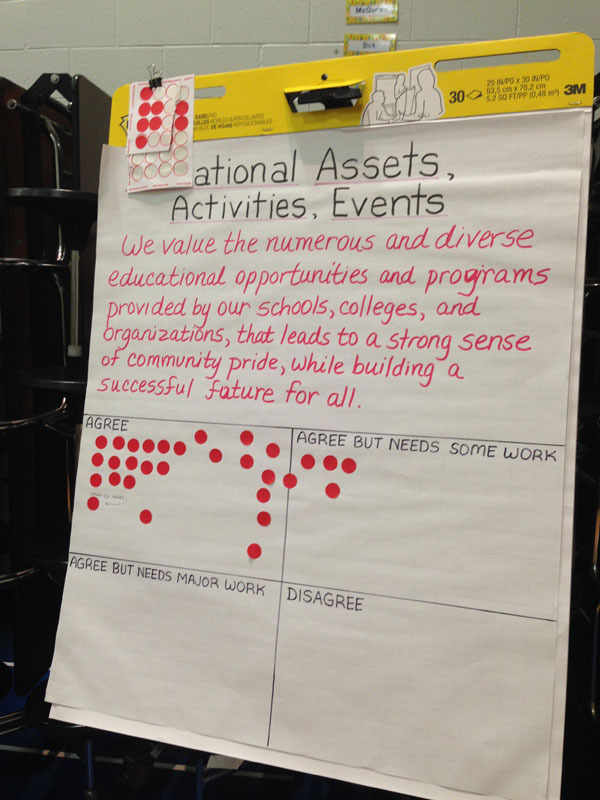 At the end of the activity, the responses were collected and placed into two categories: What people value about the city and why it is important. These will be used to create a vision statement, Trowbridge said. Adding to the delight of the event, a mural created by students in pre-school through third-grade was shared. The children drew images of what they thought was the ideal city. The mural showed colorful flowers, happy babies, recycling bins, shade trees growing, baseball played, rainbows in the sky and a house where children could play in safety and secure from harm. For the past year, Heart of Williamsport has used the content of 72 video stories to identify the common values people share, and develop vision statements that reflect these shared values. 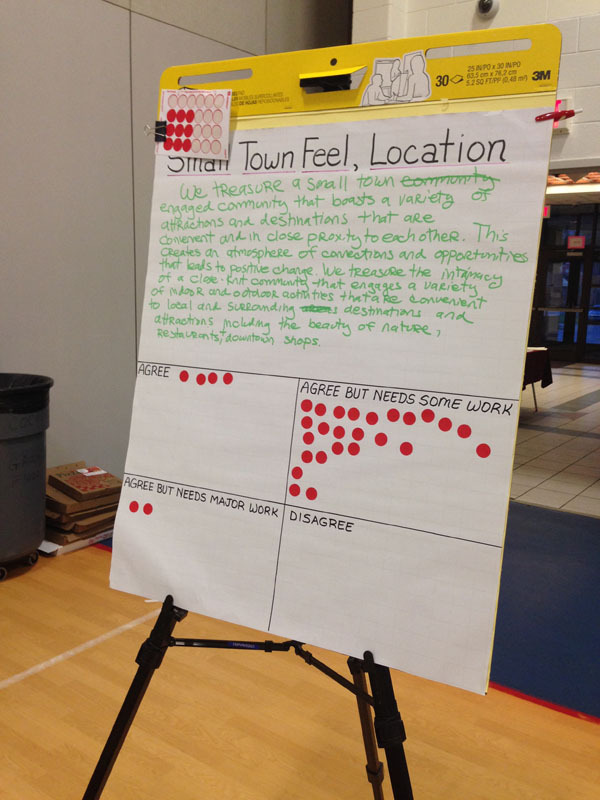 The data along with the survey responses will be shared with city and county planners and may be adopted as guiding principles for decision-making. The group is identifying projects and/or programs that will support the vision and “sense of place” that people hold dear for Williamsport and build bridges between groups of people who may not know each other.